As you know, tools are expensive and a valuable portion of the investment for most professionals: carpentry, mechanical, and auto repair among others. Tools can be targeted by petty thieves, other professionals, and even casual borrowers in your home workplace. A wise thing to do is purchase a top-of-the-line toolbox with secure locking systems and drawers designed to protect each tool adequately. 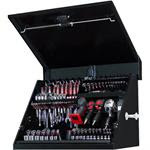 Toolboxes manufactured by Waterloo are available at Elite Toolboxes.com online. Shipping can be free on selected units. Waterloo toolboxes are made from steel, with drawers fitted with heavy-duty ball-bearing slides, heavy-duty gas struts, and casters that can support over 1,100 pounds. Their toolboxes have the advantage of manufacturer-tested endurance. These toolboxes are valuable in home workplaces, too. When a pair of durable pliers cost over $20.00, and several types are needed to address even household repairs. Screwdriver sets, drill bits, saws, and the power tools usually used add to this expense. If you total the costs of your home workshop, you will discover that your investment is considerable. A durable locking toolbox can help protect this. Most home handypersons keep their tools in the garage in a workshop at home. This is one of the most vulnerable areas of the normal house to burglars and thieves. Look for Waterloo toolboxes at elitetoolboxes.com for a solution to protecting your investment. Oh, by the way, you're on your own when it comes to lending tools to family and friends. No toolbox can protect your tools from these--Good Luck!